This thirty-one page book is suitable for children of all ages. The beautiful pictures will attract even children who cannot yet read. 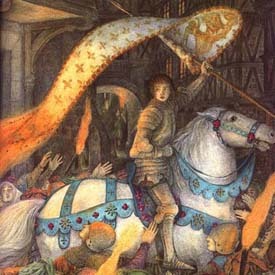 Joan's story has been simplified for young readers. There are fourteen pages of text that accurately tell Joan's fascinating life. I did not find any historical errors in the text. 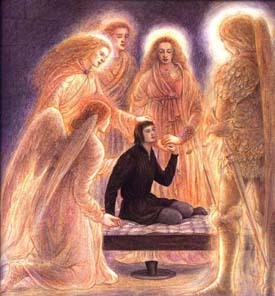 The twenty illustrations, by Angela Barrett, are detailed and quite beautiful. 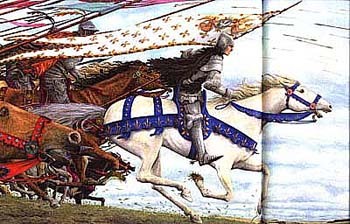 The picture of Joan's leading the army has fluidity and motion. It give you the feeling that you are part of the charge. Angela has correctly pictured Joan's white (without decoration) armor. She did not add ornate gothic decoration which came into vogue 20 years after Joan's death as so many other illustrators do. The pictures are historically correct except a couple of instances. For example the style for men in that period was for the hair to be cut above the ears. 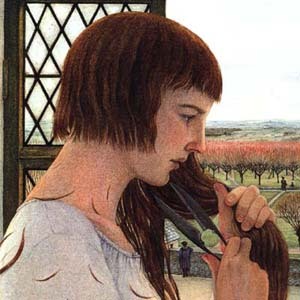 However the picture of Joan's cutting off her hair, shows the boy's cut covering her ears. In another instance the picture of Joan standing over the dead Glasdale, has him lying face up in about 8 inches of water. 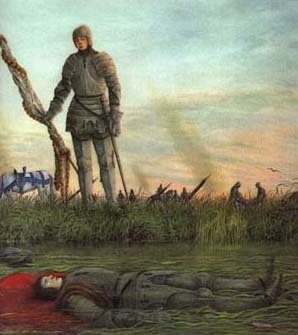 In actual fact, Glasdale fell into the deep part of the river and his body was never found.